Usually, when the Italian faces off against Spaniards, it's on the track, not the pitch. 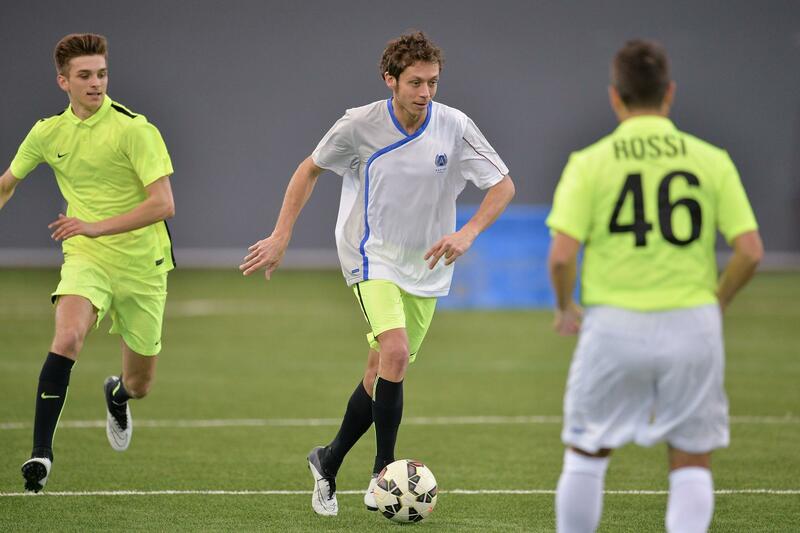 Motorcycle racing may be their first love but Valentino Rossi and his VR46 Academy riders all enjoy a good game of football, especially after a day riding at Rossi’s ranch. Usually they play friendly matches against each other, but before the Commercial Bank Grand Prix of Qatar they faced a formidable opponent: FC Barcelona legend Xavier ‘Xavi’ Hernandez. The pair took to the pitch together, Rossi supported by the likes of Nicolo Bulega, Niccolo Antonelli, Lorenzo Baldassarri, Franco Morbidelli, Luca Marini, Romano Fenati, Andrea Migno and Francesco Bagnaia while Hernandez was joined by the Aspire Academy team and former Espanyol player Sergio Garcia. A seven-aside format was played with two 10-minute halves. Kick off was followed by a goal for the Aspire Academy squad, the team backing it up with another point soon after. The Aspire Academy team took a clear lead as a shot from the half way line made it three to nothing just ahead of half time. During the second half the VR46 squad stepped up their defence and with the help of Xavi joining their side, were able to close the score to 3-2 as full time approached. The final whistle blew with the Aspire Academy taking victory 3-2. Valentino Rossi: "As a football lover, getting the opportunity to play against a great player as Xavi Hernandez is something very special. I told my team to do their best and really go for it, but there was little we could do against such a line-up!" Xavi Hernandez: "Sharing an experience like this with a motorcycling legend like Valentino Rossi is unique. I’m proud to take part in a game like this against him and his team and I have to admit they were really into it and playing for the win, not just training!" Luckily all of the VR46 Academy team will have another chance to fight for victory as the MotoGP™ World Championship begins the 2016 season under the Qatar floodlights. Free Practice begins at 18:00 Local Time on Thursday the 17th of March with racing starting at 18:00 Local Time on Sunday the 20th.